JUAN PERON Photograph Signed with Autograph Inscription. Argentine military officer and politician. Twice President of Argentina. Photograph signed by Juan Peron with his autograph inscription "Para los readactores de 'Arriba. Juan Peron" (Trans: "To the editors of Arriba"). The photograph shows Juan Peron with his wife Eva Peron ("Evita"). Evita is delivering an address at a microphone and the couple are shown surrounded by press photographers. The photograph was taken circa 1950. Approx 8 x 6 inches (20 x 15.5 cms). 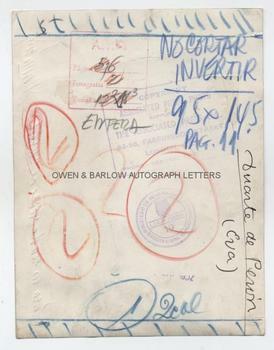 Stamps of the Argentine Ministry of Information and Associated Press Ltd on verso with red and blue picture editor's pencil for 'mark up'. Titled on verso "Duarte de Peron (Eva)". Slight crease but in very good condition. Juan Peron served two terms as president of Argentina (1946-1955 and 1973-1974). 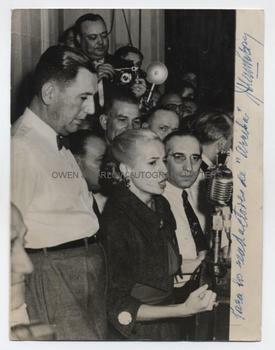 It is possible that this photograph was taken in 1951 when Evita Peron (nee Eva Duarte) was running for the office of Vice President. Juan Peron has inscribed this photo of his wife and himself to the editors of the controversial Spanish language newspaper Arriba ("Up"). Arriba was published in Madrid and was the official organ of Franco's Falange Party. A nice photograph and an interesting association.